Dramatic umbrella cloud rising to an estimated 10,000 m (33,000 ft) above sea level over Sheveluch Volcano on the Kamchatka Peninsula during the explosive dome collapse event of March 29, 2007. According to observers, a pyroclastic flow accompanied the formation of this eruption column and cloud. 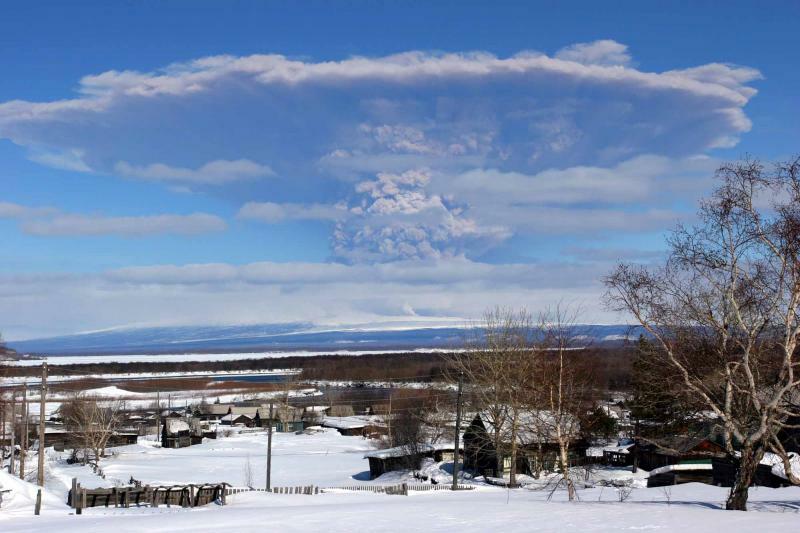 Photograph taken in the nearby community of Klyuchi by Yuri Demyanchuk, Director of the Levinson-Lessing Kamchatkan Volcanological Station at Klyuchi (Institute of Volcanology and Seismology) and Engineer for the Kamchatkan Branch of Geophysical Surveys. Used with permission. 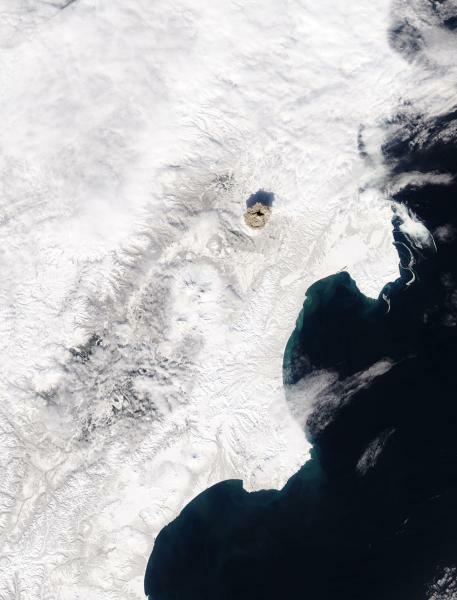 250 meter true color composite image from Aqua MODIS showing the top of the a dark, ash-rich eruption cloud from Sheveluch Volcano at about 0200 UTC, March 29, 2007. Strong seismicity related to this explosive dome collapse lasted from about 0150 to 0215 UTC, according to scientists at the Research Laboratory of Seismic and Volcanic Activity, Kamchatkan Branch of Geophysical Surveys. Based on information from several sources, the cloud eventually reached an altitude well in excess of 10 km (33,000 ft) and traveled at least 400 km (250 mi) northeast of the volcano. This MODIS image is courtesy of MODIS Rapid Response Project at NASA/GSFC.